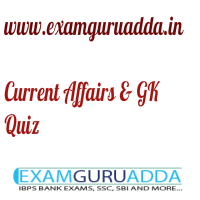 Dear Readers Examguruadda.in presents Current Affairs quiz that cover important current affair events. Current Affairs quiz for IBPS PO,clerk, RRB-PO,Clerk, SBI, NIACL, Railways and SSC Exams. 1. Which state government will launch the ‘Chatra Parivahan Suraksha Yojana’ to ensure safety of girl students? 2. Which country hosted the 26th BASIC Ministerial Meeting on Climate Change? 3. Who will become the first female president of the New York Stock Exchange (NYSE)? 4. Dr Hemu Adhikari, who passed away recently, was the noted personality from which field? 5. Who has won the prestigious 2018 Man Booker International Prize for fiction? 6. Which state government has launched ‘Nidaan’ software for disease monitoring? 7. The 2018 National Anti Terrorism Day (NATD) is celebrated on which date in India? 8. Which country is hosting its first-ever Shanghai Cooperation Organisation-Regional Anti-Terrorist Structure (SCO-RATS)? 9. India’s first national sports university will come up in which state? 10. Which Indian organisation has recently signed a pact with ABB India to benefit country from AI & robotics?